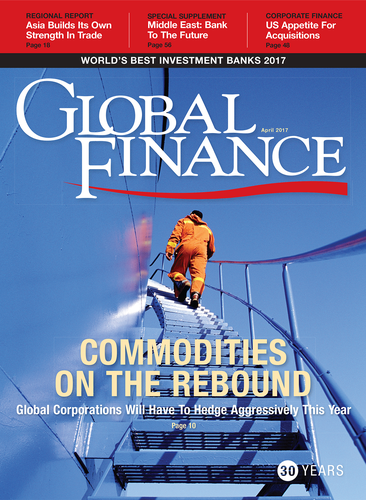 An editorial note about the April issue of Global Finance Magazine. An upturn in manufacturing activity is sending the prices of commodities up as well, forcing multinational corporations to hedge more aggressively and strategically. Cash-rich corporations are once again seeking to expand through acquisitions, often looking abroad for synergies, and that’s driving the global M&A market. Antiglobalization and rising nationalism are increasing political risks for multinational corporations, yet insurance policies don’t provide the needed coverage. Corporate and banking entities are seeking faster, more secure payment systems, and experiments in the payments space are coming to fruition. Details on the winners of Global Finance Magazine’s 2017 awards for the world’s best investment bank deals. Details on the overall global winners of Global Finance Magazine’s 2017 awards for best investment banks. Details on the sector winners of Global Finance Magazine’s 2017 awards for best investment banks. Details on the winners of Global Finance Magazine’s 2017 awards for best investment banks for M&A (mergers and acquisitions). Details on the winners of Global Finance Magazine’s 2017 awards for the world’s best investment banks for debt. Details on the winners of Global Finance Magazine’s 2017 awards for the world’s best investment banks for derivatives. Details on the winners of Global Finance Magazine’s 2017 awards for best US regional investment banks. Louis Pastina, who leads technology at consultancy Global Markets Advisory Group and previously served in technology and regulatory leadership roles at the New York Stock Exchange and the National Stock Exchange (GMAG), visited Global Finance to discuss dramatic changes in financial technology. The need for economic diversification has never been greater, as governments around the Gulf look to shore up oil-depleted revenues and boost job prospects for their fast-growing populations. Sovereigns continue to lead debt issuance in the Gulf Cooperation Council countries, with further major issuances planned for this year, as countries look to plug deficits. Middle Eastern banks are looking for merger and acquisition opportunities to help them bolster their balance sheets and expand into new product areas and markets. An interview with Central Bank governor Mohammad Al-Hashel of the Central Bank of Kuwait on the country’s banking sector. Doing business in Egypt and Turkey is not for the fainthearted. Bank Audi’s vice chairman and group strategy director says success in these markets is about being able to absorb short-term shocks. Regional political and economic uncertainty has not impeded Lebanese banks’ expansion into countries such as Jordan, Egypt, and even Iraq, says BLOM Bank’s chairman and general manager. An interview with FAHAD ALOMRAN, NARMO CAPITAL, about succession planning for family businesses in the Middle East. An interview with ISAM AL SAGER, NATIONAL BANK OF KUWAIT, about the bank’s plans to grow both inside and outside its home market. An interview with BASSEL GAMAL, QATAR ISLAMIC BANK, about growth and drawing new customers to Islamic banking. Saudi Arabia forges closer trade and economic ties with China as part of its Vision 2030 plan to diversify its economy. The Lebanese economy was hit hard in recent years, mainly by spillover from Syria’s crisis. However, the financial sector has proven resilient and domestic political stability offers renewed prospects for growth. Is Lebanon about to become the Middle East’s next oil and gas producer? After years of political deadlock, the government is about to reopen bids for offshore hydrocarbon exploration. The real estate investment market in the Middle East is exhibiting a resurgence and signs of maturity, with real estate investment trusts growing in popularity as an alternative source of capital. Global Finance magazine’s 2017 list of the Best-Performing Companies In The Middle East shows some changes at the top of the rankings, with Israel gaining position while oil-producing countries struggle with low oil prices. An interview with ADEL EL-LABBAN, AHLI UNITED BANK, about banking in the Middle East. Russia’s Central Bank chief Elvira Nabiullina retains the confidence of leadership despite shutting down some 400 banks, and even as she goes after larger financial institutions. CSX is only the latest example of shareholder activists pushing for change in leadership. Three women advancing to the top levels of the Saudi Arabian finance sector show the kingdom making progress in improving work opportunities for women. Lenders have paid more than $300 billion in fines since the 2008 financial crisis; the growing regulations are slowly forcing stronger balance sheets. Japanese banks piloted domestic and cross-border payments successfully through the Cloud with Ripple. The Asia-Pacific region surged past North America for funding of fintech enterprises in 2016, due to blockbuster China deals. Snap’s IPO had plenty of takers, even if the shares came without any power to influence corporate governance. Who were the buyers, and are they getting rooked? Multinational food conglomerates are launching funding operations to invest in—or buy outright—startups with a natural or healthful focus, to capture the credibility of these craft brands. Political pressure is on sovereign wealth funds to use investment to support local communities and infrastructure. China’s huge bond market has only recently been tapped by foreign firms—through Panda Bonds, which soared last year. A new movement is pushing back against short-term investment and narrow focus on quarterly earnings.